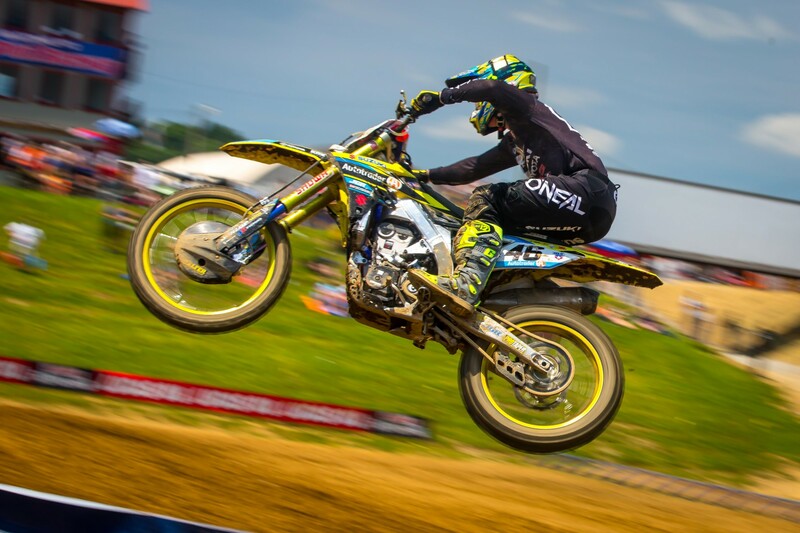 Justin Hill got his wish to ride the 450 Class, and it paid immediate dividends for the Autotrader/Yoshimura Suzuki team. 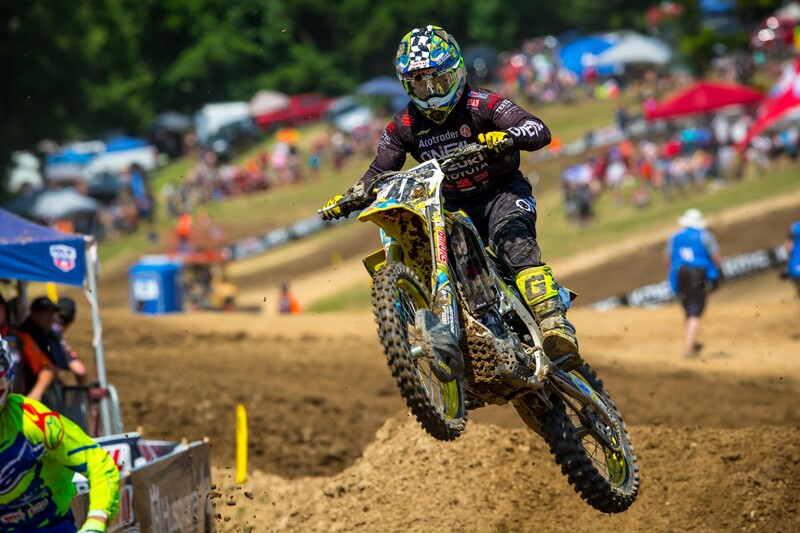 In his first career 450 race in Lucas Oil Pro Motocross, Hill put in impressive 4-6 moto scores to finish fifth overall. Following the race, he talked with Steve Matthes about the day. Racer X: “I want a 450. I like 450s. Get me on a 450.” And then look what you did today. Great ride. Justin Hill: Yeah, it’s a bike that fits me really well. I’m a bigger guy, heavier, and it just fits my style. I don’t rev bikes very much, so I get on the 450 and I just kind of cruise around in the higher gears. It’s a lot easier for me to ride. But today was unbelievably brutal. The track was unreal. Those dudes were sending it. The front three guys were really on it. Once I kind of got in behind them first moto—I got fourth first moto, and they were just running away, like, on it. There’s definitely some things I got to work on to catch that group, but this isn’t a track that generally fits me. I was a little bit worried about coming into this place, but now that we’re past this place, we’re looking pretty good. I like the rest of the tracks on the circuit. You’re a good starter, which is so key for you, too, to get out front and kind of find out the pace right away. Both motos today, it was good for you. The first moto I kind of came out decent. I came out sixth or seventh and I made some good passes right into the spot I was in. Second moto, not so much. I was probably tenth to 13th or something. Same kind of thing. I made some good passes, but some of the front guys got away. Second moto I lost the rear brake, so it was tough to get down the hills. I was really hoping I could track down Bam Bam [Justin Barcia]. I think that would have been a podium, actually, if I got Barcia. It was good because it was [Weston] Peick, Bam Bam, you, and Phil [Nicoletti]. It was like an all-time JGR battle. It seriously was. It was like the entire Hall of Fame right there. It was funny riding with Phil. I see him out there and I’m like, this is weird, dude. But you’ve got to be pumped. You’ve been telling people that you like the 450. You didn’t get on the podium today, but you came damn close. This is a real eye-opener, I think, when you can come out and do something like this first race. Absolutely. Fourth first moto out, and that’s about as close as you can get to getting on the podium. I’m hoping next weekend I get an overall podium. I got a lot more to give. Like I said, I don’t think this place generally suits me. I was coming in here thinking hopefully I can get out with a decent finish. Top five, that’s great. Top five is tough right now. There’s seven really, really good guys. The question I have for you is, J-Bone [Jeremy Albrecht, team manager] says selected races only the press release. So Justin Bogle is coming back. If you’re doing this well, have they said they’ll put a third bike out there? Have they told you? Truthfully, I really don’t know. We’ll just see. He called me. I was taking a couple days off after Thunder Valley just kind of relaxing and sleeping in and chilling and the whole deal. He calls me and I wake up and answer the phone and he’s like, “Hey, you want to ride a 450?” I’m like, “Yeah!” He’s like, “Do you want to know why?” “I don’t really care.” I’m just happy to be on it. I think today was a good day. It was good for me just to power through something. I was kind of comfortable, and it was good for me to power through it and get the experience on the bike and just try to thrive instead of just survive. So I’m happy with what I learned today on the bike and everything, too. Obviously, I only had a couple days to test the bike. I’ve only rode it six times or something like that. I’m brand-new to the thing again. I’ve been flip-flopping motorcycles. All Suzukis are good, so that’s the bonus. It’s tough to go back and forth between those engines because I ride them so differently. Going into next weekend, I’m stoked because I think I can get some better starts. I’ll work on starts this week and try to be up even closer to the front. I think I can be a podium guy. You must have made some moves early, like you said, because first time I kind of tracked you, you were higher fifth, sixth when I first tracked you. I feel like on the big bike, I’m more able to kind of make the first few corners happen better. So that’s good. It’s just a comfort zone for me. I’m pretty happy on that bike. But to answer your question earlier, I’m not sure if I’ll continue racing. I would like to. I would definitely like to be on the bike for the remainder of the season. If I get a little bit of time off, hey, that’s okay, too. I’m okay with whatever J-Bone and Coy [Gibbs, team owner] want to do. I’m really happy where I’m at over at Joe Gibbs Racing. Anything that they want to do, I’m a team player. Captain Coy was even here today to see this impressive ride. I haven’t even seen Coy in a few weeks because he’s been busy with NASCAR. He shows up and I tried. I tried today. It’s not the best finish in the entire world, but it’s not bad.